The baseball regular season is right around the corner and there's nothing better than watching a movie classic "The Sandlot". Even though the movie is now over 20 years old, it still holds up in today's pop culture. Director David Mickey Evans took time to talk to FanSided on this iconic feature and why this feature is being passed down generation to generation. 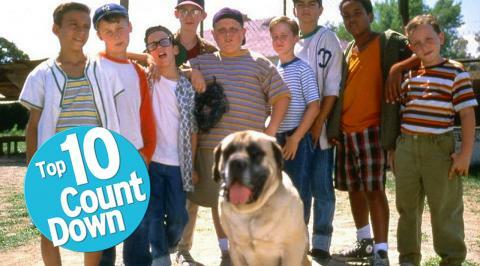 The movie "The Sandlot" came to the big screen in 1993. However, since it's debut many kids are still hooked on this movie and it keeps getting introduced to newer generation every single day. Why do you think it still has had that nostalgia factor over so many years? I think it's because people identify with it no matter what age. I think the word sandlot still exists in smaller communities. I get it these days everybody plays video games or watching television but the little league hasn't been stronger. It's not an age factor with people regarding whom likes that film. It's in it's 3rd generation of fans now and even some great grandparents held it close to their heart. With the film taking place in 1962 as an idea. It's not about baseball but it's about friendship. I never wrote about the movie to be about bullying. It certainly has those overtones but it definitely has a touchstone and identification with kids these day and can really relate. SEE MORE: Could baseball be returning to Montreal? It's stronger now on home video, paid video and any other type of digital format than it's ever been in 22 or 23 years. The movie was majority filmed in Utah. How did you and your team decide on finding this plot of land and decided it was the backdrop for the movie? Well when I wrote it it was based off my life where I grew up was in San Fernando Valley. It was a valley and surrounded by purple mountains. There's only one other place like that in the United States and that was in Salt Lake City, Utah. It was physically the only place that matched and it was very easy to shoot. Plus, I don't like shooting in Hollywood. I like to shoot away from there and that keeps people from consistently bothering you. Working with kids has it differences while filming a movie. The characters all seemed to work well together throughout the movie and really feed off each other. How was it casting these kids and working through directing the film? You write, you direct, you cast, and edit a movie. You make a movie three or four times inside a single movie. The movie was written for 8 and 9 year olds originally and they were just too young. I had to do a quick rewrite and bring them up to 12 and 13 and then Shari Rhodes went out and find these guys. You didn't have to these kids come in and be a Johnny Depp or Robert DiNero. We tried to get the kids what they are close to what is on the page but then the kid takes precedent. I rewrote stuff for each one so they didn't have to act and just be themselves. They be gelled because it was the greatest summer of their lives. I think one or two of them were in front of a camera before. At times it was like herding cats or squirrels but kids are very knowledgeable. You can ask the young actor to try to do something a different way and they wouldn't bat an eye. You would never try that with an older actor. You can line read them as well. We did that for the first week or two and then they got the hang of it. We also gave them mannerisms. We gave Chauncey (Squints) the glasses which he picked out and I put the tape on them. Then I told him now when the slip down your nose use your index finger to push them back up. Little things like that just appear. Many times there isn't written dialogue. For example, in the middle of the movie where they are trying to get the ball back from the beast with all those contraptions. What I did was put little transmitters in their ears and I had a broadcast mic and I would speak to them. It was quite cool and it kept things very much in the moment. One iconic scene in the movie was the erector set being used to send the robot car down to catapult the ball over the fence and into the yard. What was the process putting that scene together? In the script it was a lot bigger deal. In a scene before that Scotty showed up to the tree house with different Period Erector sets. My prop master actually found two sets that were $5,000 a piece. Some of it were original parts from the set, but the big ramp was angled iron that on set effect teams built it for me right there. That thing did really work and it was electronically controlled and a wireless remote. It was pretty cool. The Beast was the antagonist of the film and in your blog you had a couple pictures of two stuntmen in the big dog suit. You also mentioned you used some real dogs as well. What difficulties did you face when filming with different variations of the Beast? I think we had 4 or 5 English Mastiffs that were in the film. At the end of the scene were the dog is licking Scotty's face, he was huge. The dog that actually chased Benny, was actually smaller and could actually run. These dogs usually just sit around, lick and slobber. We had one big animatronic head that we used that was the size of a lion's head. The kids loved it though. We let them mess around with it and let them have fun with it. We then had a couple of big over sized paws when we did close-ups on the paw coming over a ball. Then like you mentioned we had the two puppeteers in the suit walking around. Remember this was in the summer of 1992 and it was like 110 degrees all day, every day. The line "You're killing me smalls" is something that has been used not only to relate to the movie but in normal conversations. Why do you think that line still has that sort of power in today's world? There's no way to predict that line would be so popular in today's world. I thought it was funny when I wrote it but no way I thought it would take off like it has. It wasn't laugh out loud funny until we actually filmed it. The first time Patrick Renna (Hamilton Porter) said it was when he was teaching Scotty how to make a smores. That was like 15 takes because all the other kids are busting up. We knew that line was written only for him. Over the years I've heard it all over the world. Some guy on the internet did some algorithm research that It is one of top three movie lines in movie history. The 1990's were big into baseball movies but also family movies. As the years have moved on there has been less of that on the big screen that relate to "The Sandlot". Do you think if you made this movie in this decade it would be an even bigger hit than it was? No I don't think so. Even if I was going to make that movie today, um good luck. It would be virtually impossible. The independent film making has really suffered and it's very difficult to find money for them. There was more high tech stuff available to me when I made the film but I used very simple things. But if I made it today I wouldn't change a thing. Remember it was 1962 so if you have some slick Beast stuff it's going to be completely anachronistic. It just wouldn't fit. The idea was supposed to fit in those kid's imaginations and nightmares what it would be like in that era. It was very good usage of traditional technology. There were many scenes that have you go "Oh my God". Not only you were the director but you were also the narrator of the film. Looking back at it, can you choose one scene that you still hold as your favorite? My favorite scene had to be the nighttime where Ray Charles was singing and the fireworks were going off overhead. It wasn't the way it was for me as a kid, but it should have been. The scene itself was very difficult to shoot. You see all those kids were minors and most of them were from California. So the child labor laws followed you wherever you go, so we had literally two hours to shoot that scene. I have the kids looking up at the fireworks, I have Benny hitting that ball that has to land in the perfect spot where the camera lens was. I think each close up was one take. It was incredibly difficult. The fireworks didn't happen during that scene as those were filmed during the 4th of July in Salt Lake City. When the ball sequence happened a pitching machine was used and it was one shot needed where the ball landed near the lens. It was pretty tough but it came out great. Another amazing scene in the movie was every kid at Squint's age pulling off the most amazing trick of kissing Wendy Peffercorn. Can you talk about how you explained the scene to Chauncey Leopardi and how he would have to kiss a girl? Well Marley Shelton was 18 or 19 at the time and she was an absolute sweetheart. You have to understand that Chauncey was the exact opposite of his character in the movie. Outside of the movie set, even though he was small he was a player. He wore baggy pants, wore his hat sideways and was a charming little dude. But when this scene came he was absolutely terrified in doing this scene. We shot it once and got it. Then he decided to ask for another take. So I went to Marley and she said yes. A lot of people can relate to these characters such as Scotty Smalls not having any friends and then at the end made a group of friends that he would have for a lifetime? Do you think people have the biggest connection to him when they see this movie? I really think so. All of us identify with them at some point during our childhood. Nobody was the popular kid from day one. At some time, they have those growing pains and those unfortunate moments happen. And the actor that played Smalls wasn't like his character at all. He was actually I think a 3rd degree black belt. So we had to work with him on throwing the ball goofy. I think everyone identifies that part of his character where you have growing pains. This is all in retrospect now. When I was writing it and shooting it, I was trying to be funny. With this movie being so popular were there any props that you got to keep that are still in your possession today? I have so many. I have Benny's shoes; I have the 3 original Babe Ruth balls. I have the original plaque that was on the wall of Dodger Stadium at the end of the film. I actually took that photo on the last day right after we wrapped shooting. I have some stuff from Mr. Mertle's house.